The UPnP Device Architecture specification provides the protocols for a peer-to-peer network. It specifies how to join a network and how devices can be controlled using XML messages sent over HTTP. The OSGi specifications address how code can be download and managed in a remote system. Both standards are therefore fully complimentary. Using an OSGi Framework to work with UPnP enabled devices is therefore a very successful combination. This specification specifies how OSGi bundles can be developed that interoperate with UPnP™ (Universal Plug and Play) devices and UPnP control points. The specification is based on the UPnP Device Architecture and does not further explain the UPnP specifications. The UPnP specifications are maintained by  UPnP Forum. UPnP™ is a trademark of the UPnP Implementers Corporation. Scope - This specification is limited to device control aspects of the UPnP specifications. Aspects concerning the TCP/IP layer, like DHCP and limited TTL, are not addressed. Transparency - OSGi services should be made available to networks with UPnP enabled devices in a transparent way. Network Selection - It must be possible to restrict the use of the UPnP protocols to a selection of the connected networks. For example, in certain cases OSGi services that are UPnP enabled should not be published to the Wide Area Network side of a gateway, nor should UPnP devices be detected on this WAN. Event handling - Bundles must be able to listen to UPnP events. Export OSGi services as UPnP devices - Enable bundles that make a service available to UPnP control points. Implement UPnP Control Points - Enable bundles that control UPnP devices. UPnP Base Driver - The bundle that implements the bridge between OSGi and UPnP networks. This entity is not represented as a service. UPnP Root Device -A physical device can contain one or more root devices. Root devices contain one ore more devices. A root device is modeled with a UPnPDevice object, there is no separate interface defined for root devices. UPnP Device - The representation of a UPnP device. A UPnP device may contain other UPnP devices and UPnP services. This entity is represented by a UPnPDevice object. A device can be local (implemented in the Framework) or external (implemented by another device on the net). UPnP Service -A UPnP device consists of a number of services. A UPnP service has a number of UPnP state variables that can be queried and modified with actions. This concept is represented by a UPnPService object. UPnP Action - A UPnP service is associated with a number of actions that can be performed on that service and that may modify the UPnP state variables. This entity is represented by a UPnPAction object. UPnP State Variable - A variable associated with a UPnP service, represented by a UPnPStateVariable object. UPnP Local State Variable - Extends the UPnPStateVariable interface when the state variable is implemented locally. This interface provides access to the actual value. UPnP Event Listener Service - A listener to events coming from UPnP devices. UPnP Host - The machine that hosts the code to run a UPnP device or control point. UPnP Control Point - A UPnP device that is intended to control UPnP devices over a network. For example, a UPnP remote controller. UPnP Icon - A representation class for an icon associated with a UPnP device. UPnP Exception - An exception that delivers errors that were discovered in the UPnP layer. UDN - Unique Device Name, a name that uniquely identifies the a specific device. To make a UPnP service available to UPnP control points on a network, an OSGi service object must be registered under the UPnPDevice interface with the Framework. The UPnP driver bundle must detect these UPnP Device services and must make them available to the network as UPnP devices using the UPnP protocol. UPnP devices detected on the local network must be detected and automatically registered under the UPnPDevice interface with the Framework by the UPnP driver implementation bundle. A bundle that wants to control UPnP devices, for example to implement a UPnP control point, should track UPnP Device services in the OSGi service registry and control them appropriately. Such bundles should not distinguish between resident or remote UPnP Device services. The UPnP DA is intended to be used in a broad range of device from the computing (PCs printers), consumer electronics (DVD, TV, radio), communication (phones) to home automation (lighting control, security) and home appliances (refrigerators, coffee makers) domains. For example, a UPnP TV might announce its existence on a network by broadcasting a message. A UPnP control point on that network can then discover this TV by listening to those announce messages. The UPnP specifications allow the control point to retrieve information about the user interface of the TV. This information can then be used to allow the end user to control the remote TV from the control point, for example turn it on or change the channels. Detect and control a UPnP standardized device. In this case the control point and the remote device share a priori knowledge about how the device should be controlled. The UPnP Forum intends to define a large number of these standardized devices. Use a user interface description. A UPnP control point receives enough information about a device and its services to automatically build a user interface for it. Programmatic Control. A program can directly control a UPnP device without a user interface. This control can be based on detected information about the device or through a priori knowledge of the device type. Allows the user to browse a web page supplied by the device. This web page contains a user interface for the device that be directly manipulated by the user. However, this option is not well defined in the UPnP Device Architecture specification and is not tested for compliance. The UPnP Device Architecture specification and the OSGi Framework provide complementary functionality. The UPnP Device Architecture specification is a data communication protocol that does not specify where and how programs execute. That choice is made by the implementations. In contrast, the OSGi Framework specifies a (managed) execution point and does not define what protocols or media are supported. The UPnP specification and the OSGi specifications are fully complementary and do not overlap. How an OSGi bundle can implement a service that is exported to the network via the UPnP protocols. How to find and control services that are available on the local network. The UPnP specifications related to the assignment of IP addresses to new devices on the network or auto-IP self configuration should be handled at the operating system level. Such functions are outside the scope of this specification. Discover UPnP devices on the network and map each discovered device into an OSGi registered UPnP Device service. Present UPnP marked services that are registered with the OSGi Framework on one or more networks to be used by other computers. The principle entity of the UPnP specification is the UPnP device. There is a UPnP root device that represents a physical appliance, such as a complete TV. The root device contains a number of sub-devices. These might be the tuner, the monitor, and the sound system. Each sub-device is further composed of a number of UPnP services. A UPnP service represents some functional unit in a device. For example, in a TV tuner it can represent the TV channel selector. 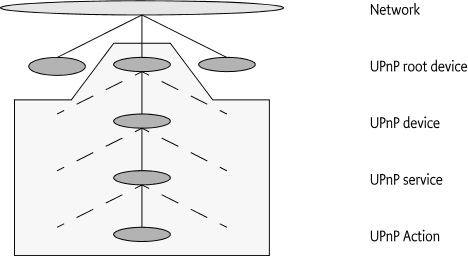 Figure 111.2 on page illustrates this hierarchy. Each UPnP service can be manipulated with a number of UPnP actions. UPnP actions can modify the state of a UPnP state variable that is associated with a service. For example, in a TV there might be a state variable volume. There are then actions to set the volume, to increase the volume, and to decrease the volume. The UPnP root device is registered as a UPnP Device service with the Framework, as well as all its sub-devices. Most applications will work with sub-devices, and, as a result, the children of the root device are registered under the UPnPDevice interface. UPnP device properties are defined per sub-device in the UPnP specification. These properties must be registered with the OSGi Framework service registry so they are searchable. Bundles that want to handle the UPnP device hierarchy can use the registered service properties to find the parent of a device (which is another registered UPnPDevice). PARENT_UDN - (String) The Universal Device Name (UDN) of the parent device. A root device most not have this property registered. Type is a String object. CHILDREN_UDN - (String) An array of UDNs of this device's children. Both imported (from the network to the OSGi service registry) and exported (from the service registry to the network) UPnPDevice services must have the same representation in the OSGi Framework for identical devices. For example, if an OSGi UPnP Device service is exported as a UPnP device from an OSGi Framework to the network, and it is imported into another OSGi Framework, the object representation should be equal. Application bundles should therefore be able to interact with imported and exported forms of the UPnP device in the same manner. Imported and exported UPnP devices differ only by two marker properties that can be added to the service registration. One marker, DEVICE_CATEGORY, should typically be set only on imported devices. By not setting DEVICE_CATEGORY on internal UPnP devices, the Device Manager does not try to refine these devices (See the Device Access Specification for more information about the Device Manager). If the device service does not implement the Device interface and does not have the DEVICE_CATEGORY property set, it is not considered a device according to the Device Access Specification. The other marker, UPNP_EXPORT, should only be set on internally created devices that the bundle developer wants to export. By not setting UPNP_EXPORT on registered UPnP Device services, the UPnP Device service can be used by internally created devices that should not be exported to the network. This allows UPnP devices to be simulated within an OSGi Framework without announcing all of these devices to any networks. The UPNP_EXPORT service property has no defined type, any value is correct. A UPnP device can optionally support an icon. The purpose of this icon is to identify the device on a UPnP control point. UPnP control points can be implemented in large computers like PC's or simple devices like a remote control. However, the graphic requirements for these UPnP devices differ tremendously. The device can, therefore, export a number of icons of different size and depth. In the UPnP specifications, an icon is represented by a URL that typically refers to the device itself. In this specification, a list of icons is available from the UPnP Device service. In order to obtain localized icons, the method getIcons(String) can be used to obtain different versions. If the locale specified is a null argument, then the call returns the icons of the default locale of the called device (not the default locale of the UPnP control point).When a bundle wants to access the icon of an imported UPnP device, the UPnP driver gets the data and presents it to the application through an input stream. A bundle that needs to export a UPnP Device service with one or more icons must provide an implementation of the UPnPIcon interface. This implementation must provide an InputStream object to the actual icon data. The UPnP driver bundle must then register this icon with an HTTP server and include the URL to the icon with the UPnP device data at the appropriate place. UPnP Device services are devices in the context of the Device Manager. This means that these services need to register with a number of properties to participate in driver refinement. The value for UPnP devices is defined in the UPnPDevice constant DEVICE_CATEGORY. The value is UPnP. The UPnPDevice interface contains a number of constants for matching values. Refer to MATCH_GENERIC for further information. A UPnP Device contains a number of UPnPService objects. UPnPService objects combine zero or more actions and one or more state variables. The UPnPStateVariable interface encapsulates the properties of a UPnP state variable. In addition to the properties defined by the UPnP specification, a state variable is also mapped to a Java data type. The Java data type is used when an event is generated for this state variable and when an action is performed containing arguments related to this state variable. There must be a strict correspondence between the UPnP data type and the Java data type so that bundles using a particular UPnP device profile can predict the precise Java data type. The function QueryStateVariable defined in the UPnP specification has been deprecated and is therefore not implemented. It is recommended to use the UPnP event mechanism to track UPnP state variables. Additionally, a UPnPStateVariable object can also implement the UPnPLocalStateVariable interface if the device is implemented locally. That is, the device is not imported from the network. The UPnPLocalStateVariable interface provides a getCurrentValue() method that provides direct access to the actual value of the state variable. The UPnP driver must register all discovered UPnP devices in the local networks. These devices are registered under a UPnPDevice interface with the OSGi Framework. Using a remote UPnP device thus involves tracking UPnP Device services in the OSGi service registry. The following code illustrates how this can be done. The sample Controller class extends the ServiceTracker class so that it can track all UPnP Device services and add them to a user interface, such as a remote controller application. Register an UPnP Device service with the registration property UPNP_EXPORT. Use the registration property PRESENTATION_URL to provide the presentation page. The service implementer must register its own servlet with the Http Service to serve out this interface. This URL must point to that servlet. There can be multiple UPnP root devices hosted by one OSGi platform. The relationship between the UPnP devices and the OSGi platform is defined by the PARENT_UDN and CHILDREN_UDN service properties. The bundle registering those device services must make sure these properties are set accordingly. Devices that are implemented on the OSGi Framework (in contrast with devices that are imported from the network) should use the UPnPLocalStateVariable interface for their state variables instead of the UPnPStateVariable interface. This interface provides programmatic access to the actual value of the state variable as maintained by the device specific code. There are two distinct event directions for the UPnP Service specification. External events from the network must be dispatched to listeners inside the OSGi Frameworks. The UPnP Base driver is responsible for mapping the network events to internal listener events. Implementations of UPnP devices must send out events to local listeners as well as cause the transmission of the UPnP network events. UPnP events are sent using the whiteboard model, in which a bundle interested in receiving the UPnP events registers an object implementing the UPnPEventListener interface. A filter can be set to limit the events for which a bundle is notified. The UPnP Base driver must register a UPnP Event Lister without filter that receives all events. If a service is registered with a property named upnp.filter with the value of an instance of an Filter object, the listener is only notified for matching events (This is a Filter object and not a String object because it allows the InvalidSyntaxException to be thrown in the client and not the UPnP driver bundle). UPnPService.ID - (UPnP.service.id/String) Service identity. Only events generated by services matching the given service ID are delivered. UPnPService.TYPE - (UPnP.service.type/String or String) Only events generated by services of the given type are delivered. If an event is generated by either a local device or via the base driver for an external device, the notifyUPnPEvent(String,String,Dictionary) method is called on all registered UPnPEventListener services for which the optional filter matches for that event. If no filter is specified, all events must be delivered. If the filter does not match, the UPnP Driver must not call the UPnP Event Listener service. The way events must be delivered is the same as described in Delivering Events of OSGi Core Release 7. One or multiple events are passed as parameters to the notifyUPnPEvent(String,String,Dictionary) method. The Dictionary object holds a pair of UpnPStateVariable objects that triggered the event and an Object for the new value of the state variable. Special care must be taken with the initial subscription to events. According to the UPnP specification, when a client subscribes for notification of events for the first time, the device sends out a number of events for each state variable, indicating the current value of each state variable. This behavior simplifies the synchronization of a device and an event-driven client. The UPnP Base Driver must mimic this event distribution on behalf of external devices. It must therefore remember the values of the state variables of external devices. A UPnP Device implementation must send out these initial events for each state variable they have a value for. The UPnP Base Driver must have stored the last event from the device and retransmit the value over the multicast network. The UPnP Driver must register an event listener without any filter for this purpose. The call to the listener's notification method must be done asynchronously. upnp.deviceId - (String) The identity as defined by UPnPDevice.UDN of the device sending the event. upnp.serviceId - (String) The identity of the service sending the events. upnp.events - (Dictionary) A Dictionary object containing the new values for the state variables that have changed. All values of the UPnP properties are obtained from the device using the device's default locale. If an application wants to query a set of localized property values, it has to use the method getDescriptions(String). For localized versions of the icons, the method getIcons(String) is to be used. The UPnP specification uses different types for date and time concepts. An overview of these types is given in the following table. The UPnP specification points to  XML Schema. In this standard,  ISO 8601 Date And Time formats are referenced. The mapping is not completely defined which means that this OSGi UPnP specification defines a complete mapping to Java classes. The UPnP types date, dateTime and dateTime.tz are represented as a Date object. For the date type, the hours, minutes and seconds must all be zero. The UPnP types time and time.tz are represented as a Long object that represents the number of ms since midnight. If the time wraps to the next day due to a time zone value, then the final value must be truncated modulo 86.400.000. INVALID_ACTION - (401) No such action could be found. INVALID_ARGS - (402) Invalid argument. INVALID_SEQUENCE_NUMBER - (403) Out of synchronization. INVALID_VARIABLE - (404) State variable not found. DEVICE_INTERNAL_ERROR - (501) Internal error. Common Action Errors - In the range of 600-69, defined by the UPnP Forum Technical Committee. Action Specific Errors - In the range of 700-799, defined by the UPnP Forum Working Committee. Non-Standard Action Specific Errors - In the range of 800-899. Defined by vendors. In order to provide a standardized way to configure a UPnP driver bundle, the Configuration Admin property upnp.ssdp.address is defined. Those addresses define the interfaces which the UPnP driver is operating on. If no SSDP address is specified, the default assumed will be 239.255.255.250:1900. If no port is specified, port 1900 is assumed as default. The operating system must support multicasting on the selected network device. In certain cases, a multicasting route has to be set in the operating system routing table. These configurations are highly dependent on the underlying operating system and beyond the scope of this specification. The UPnP specification is based on HTTP and uses plain text SOAP (XML) messages to control devices. For this reason, it does not provide any inherent security mechanisms. However, the UPnP specification is based on the exchange of XML files and not code. This means that at least worms and viruses cannot be implemented using the UPnP protocols. However, a bundle registering a UPnP Device service is represented on the outside network and has the ability to communicate. The same is true for getting a UPnP Device service. It is therefore recommended that ServicePermission[UPnPDevice|UPnPEventListener, REGISTER|GET] be used sparingly and only for bundles that are trusted. UPnPAction - A UPnP action. UPnPDevice - Represents a UPnP device. 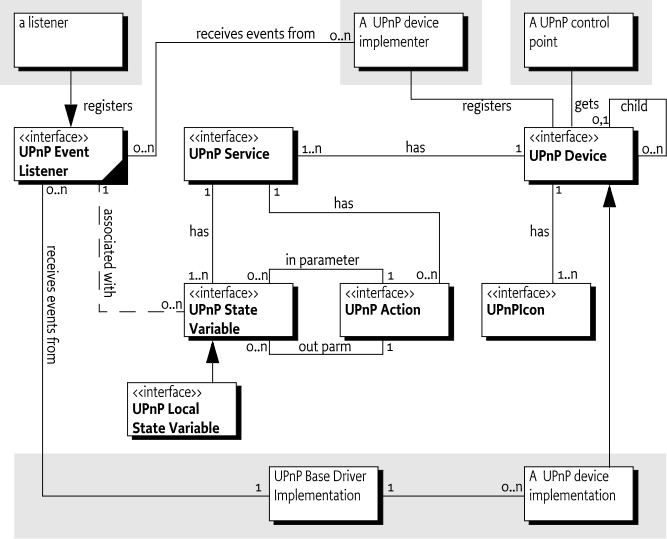 UPnPEventListener - UPnP Events are mapped and delivered to applications according to the OSGi whiteboard model. UPnPException - There are several defined error situations describing UPnP problems while a control point invokes actions to UPnPDevices. UPnPIcon - A UPnP icon representation. UPnPLocalStateVariable - A local UPnP state variable which allows the value of the state variable to be queried. UPnPService - A representation of a UPnP Service. UPnPStateVariable - The meta-information of a UPnP state variable as declared in the device's service state table (SST). □ Lists all input arguments for this action. Returns Array of input argument names or null if no input arguments. □ Returns the action name. The action name corresponds to the name field in the actionList of the service description. □ List all output arguments for this action. Returns Array of output argument names or null if there are no output arguments. □ Returns the name of the designated return argument. Returns The name of the designated return argument or null if none is marked. argumentName The name of the UPnP action argument. □ Finds the state variable associated with an argument name. Helps to resolve the association of state variables with argument names in UPnP actions. Returns State variable associated with the named argument or null if there is no such argument. Throws IllegalStateException– if the UPnP action has been removed from the network. args A Dictionary of arguments. Must contain the correct set and type of arguments for this action. May be null if no input arguments exist. □ Invokes the action. The input and output arguments are both passed as Dictionary objects. Each entry in the Dictionary object has a String object as key representing the argument name and the value is the argument itself. The class of an argument value must be assignable from the class of the associated UPnP state variable. The input argument Dictionary object must contain exactly those arguments listed by getInputArguments method. The output argument Dictionary object will contain exactly those arguments listed by getOutputArguments method. Returns A Dictionary with the output arguments. null if the action has no output arguments. Throws UPnPException– A UPnP error has occurred. IllegalStateException– if the UPnP action has been removed from the network. Exception– The execution fails for some reason. 111.16.3.1 public static final String CHILDREN_UDN = "UPnP.device.childrenUDN"
111.16.3.2 public static final String DEVICE_CATEGORY = "UPnP"
111.16.3.3 public static final String FRIENDLY_NAME = "UPnP.device.friendlyName"
111.16.3.4 public static final String ID = "UPnP.device.UDN"
111.16.3.5 public static final String MANUFACTURER = "UPnP.device.manufacturer"
111.16.3.6 public static final String MANUFACTURER_URL = "UPnP.device.manufacturerURL"
111.16.3.12 public static final String MODEL_DESCRIPTION = "UPnP.device.modelDescription"
111.16.3.13 public static final String MODEL_NAME = "UPnP.device.modelName"
111.16.3.14 public static final String MODEL_NUMBER = "UPnP.device.modelNumber"
111.16.3.15 public static final String MODEL_URL = "UPnP.device.modelURL"
111.16.3.16 public static final String PARENT_UDN = "UPnP.device.parentUDN"
111.16.3.17 public static final String PRESENTATION_URL = "UPnP.presentationURL"
111.16.3.18 public static final String SERIAL_NUMBER = "UPnP.device.serialNumber"
111.16.3.19 public static final String TYPE = "UPnP.device.type"
111.16.3.20 public static final String UDN = "UPnP.device.UDN"
111.16.3.21 public static final String UPC = "UPnP.device.UPC"
111.16.3.22 public static final String UPNP_EXPORT = "UPnP.export"
locale A language tag as defined by RFC 1766 and maintained by ISO 639. Examples include "de", "en" or " en-US". The default locale of the device is specified by passing a null argument. □ Get a set of localized UPnP properties. The UPnP specification allows a device to present different device properties based on the client's locale. The properties used to register the UPnPDevice service in the OSGi registry are based on the device's default locale. To obtain a localized set of the properties, an application can use this method. □ Lists all icons for this device in a given locale. The UPnP specification allows a device to present different icons based on the client's locale. Returns Array of icons or null if no icons are available. Throws IllegalStateException– if the UPnP device has been removed from the network. □ Locates a specific service by its service id. Returns The requested service or null if not found. □ Lists all services provided by this device. Returns Array of services or null if no services are available. 111.16.4.1 public static final String UPNP_FILTER = "upnp.filter"
events Dictionary object containing the new values for the state variables that have changed. errorCode error code which defined by UPnP Device Architecture V1.0. errorDescription error description which explain the type of problem. □ This constructor creates a UPnPException on the specified error code and error description. errorDescription error description which explain the type of the problem. errorCause cause of that UPnPException. □ This constructor creates a UPnPException on the specified error code, error description and error cause. □ Returns the UPnPError Code occurred by UPnPDevices during invocation. Returns The UPnPErrorCode defined by a UPnP Forum working committee or specified by a UPnP vendor. Deprecated As of 1.2. Replaced by getUPnPErrorCode(). □ Returns the UPnP Error Code occurred by UPnPDevices during invocation. □ Returns the color depth of the icon in bits. Returns The color depth in bits. If the actual color depth of the icon is unknown, -1 is returned. □ Returns the height of the icon in pixels. If the actual height of the icon is unknown, -1 is returned. Returns The height in pixels, or -1 if unknown. □ Returns an InputStream object for the icon data. The InputStream object provides a way for a client to read the actual icon graphics data. The number of bytes available from this InputStream object can be determined via the getSize() method. The format of the data encoded can be determined by the MIME type available via the getMimeType() method. Returns An InputStream to read the icon graphics data from. Throws IOException– If the InputStream cannot be returned. IllegalStateException– if the UPnP device has been removed from the network. □ Returns the MIME type of the icon. This method returns the format in which the icon graphics, read from the InputStream object obtained by the getInputStream() method, is encoded. Returns The MIME type of the encoded icon. □ Returns the size of the icon in bytes. This method returns the number of bytes of the icon available to read from the InputStream object obtained by the getInputStream() method. If the actual size can not be determined, -1 is returned. Returns The icon size in bytes, or -1 if the size is unknown. □ Returns the width of the icon in pixels. If the actual width of the icon is unknown, -1 is returned. Returns The width in pixels, or -1 if unknown. □ This method will keep the current values of UPnPStateVariables of a UPnPDevice whenever UPnPStateVariable's value is changed , this method must be called. Returns Object current value of UPnPStateVariable. If the current value is initialized with the default value defined UPnP service description. Throws IllegalStateException– If the UPnP state variable has been removed. 111.16.8.1 public static final String ID = "UPnP.service.id"
111.16.8.2 public static final String TYPE = "UPnP.service.type"
name Name of action. Must not contain hyphen or hash characters. Should be < 32 characters. □ Locates a specific action by name. Looks up an action by its name. Returns The requested action or null if no action is found. Throws IllegalStateException– if the UPnP service has been removed from the network. □ Lists all actions provided by this service. Returns Array of actions (UPnPAction )or null if no actions are defined for this service. □ Returns the serviceId field in the UPnP service description. Returns The service ID suffix defined by a UPnP Forum working committee or specified by a UPnP vendor. Must be <= 64 characters. Single URI. Returns State variable or null if no such state variable exists for this service. □ Lists all UPnPStateVariable objects provided by this service. Returns Array of state variables or null if none are defined for this service. □ Returns the serviceType field in the UPnP service description. Returns The service type suffix defined by a UPnP Forum working committee or specified by a UPnP vendor. Must be <= 64 characters, not including the version suffix and separating colon. Single URI. □ Returns the version suffix encoded in the serviceType field in the UPnP service description. Returns The integer service version defined by a UPnP Forum working committee or specified by a UPnP vendor. 111.16.9.1 public static final String TYPE_BIN_BASE64 = "bin.base64"
111.16.9.2 public static final String TYPE_BIN_HEX = "bin.hex"
111.16.9.3 public static final String TYPE_BOOLEAN = "boolean"
111.16.9.4 public static final String TYPE_CHAR = "char"
111.16.9.5 public static final String TYPE_DATE = "date"
111.16.9.6 public static final String TYPE_DATETIME = "dateTime"
111.16.9.7 public static final String TYPE_DATETIME_TZ = "dateTime.tz"
111.16.9.8 public static final String TYPE_FIXED_14_4 = "fixed.14.4"
111.16.9.9 public static final String TYPE_FLOAT = "float"
111.16.9.10 public static final String TYPE_I1 = "i1"
111.16.9.11 public static final String TYPE_I2 = "i2"
111.16.9.12 public static final String TYPE_I4 = "i4"
111.16.9.13 public static final String TYPE_INT = "int"
111.16.9.14 public static final String TYPE_NUMBER = "number"
111.16.9.15 public static final String TYPE_R4 = "r4"
111.16.9.16 public static final String TYPE_R8 = "r8"
111.16.9.17 public static final String TYPE_STRING = "string"
111.16.9.18 public static final String TYPE_TIME = "time"
111.16.9.19 public static final String TYPE_TIME_TZ = "time.tz"
111.16.9.20 public static final String TYPE_UI1 = "ui1"
111.16.9.21 public static final String TYPE_UI2 = "ui2"
111.16.9.22 public static final String TYPE_UI4 = "ui4"
111.16.9.23 public static final String TYPE_URI = "uri"
111.16.9.24 public static final String TYPE_UUID = "uuid"
□ Returns the allowed values, if defined. Allowed values can be defined only for String types. Returns The allowed values or null if not defined. Should be less than 32 characters. □ Returns the default value, if defined. Returns The default value or null if not defined. The type of the returned object can be determined by getJavaDataType. □ Returns the Java class associated with the UPnP data type of this state variable. Returns A class object corresponding to the Java type of this argument. □ Returns the maximum value, if defined. Maximum values can only be defined for numeric types. Returns The maximum value or null if not defined. □ Returns the minimum value, if defined. Minimum values can only be defined for numeric types. Returns The minimum value or null if not defined. □ Returns the variable name. Returns Name of state variable. Must not contain a hyphen character nor a hash character. Should be < 32 characters. □ Returns the size of an increment operation, if defined. Step sizes can be defined only for numeric types. Returns The increment size or null if not defined. □ Returns the UPnP type of this state variable. Valid types are defined as constants. Returns The UPnP data type of this state variable, as defined in above constants. □ Tells if this StateVariable can be used as an event source. If the StateVariable is eventable, an event listener service can be registered to be notified when changes to the variable appear. Returns true if the StateVariable generates events, false otherwise.